Developing the right mindset for success is not always an easy thing to do. We all have fears and doubts and past experiences that tell us we should not be a success. We may even have people in our lives who give us that same message. Most of us just live for the day, work to pay the bills and wish and hope for more. We try and try but cannot seem to figure out how to find that “more”. We might create that dream board, write out our goals and have a vision for what we want to accomplish but we feel like it is such a struggle to make any progress. Life piles up and it seems so overwhelming. We get caught up in the today, the right now, the urgency of whatever is pulling us in a million directions. I think that far too often we end up settling for the crumbs; just grabbing at whatever sweet little drop of morsels that we can see. The truth is there is a big, rich, scrumptious yummy triple chocolate cake sitting on the counter right above our heads. 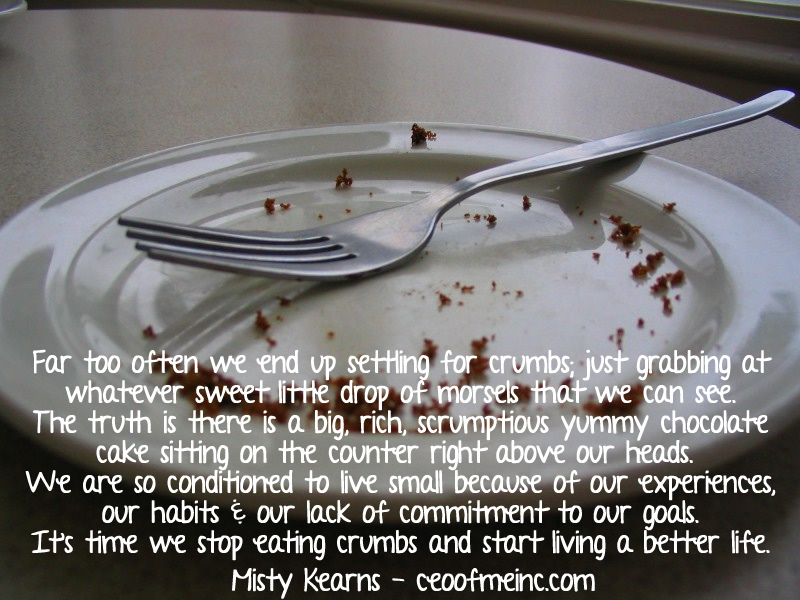 We tend to only see the crumbs on the counter because we are so conditioned to live small because of our experiences, our habits, our lack of commitment to our goals. 1. Living a life of gratitude. Gratitude changes everything. When you count your blessings and look for the good in all that you experience, a shift will begin to take place in your mind and your heart. 2. Focusing on the bigger picture. It is easy to get caught up in the here and now and only see the crisis at hand or struggle you are facing. Remember this too shall pass. There is so much more to life, so much more to experience and enjoy. 3. Changing our habits. We are what we repeatedly do. Look closely at how you spend your days and decide what your ideal day would be like then work to create that life. Don’t try to change everything all at once for you will surely fail. Commit to making small changes over time in the areas you need to improve on. 4. Committing to excellence in all that we do. Strive to always give and be your best. Never compromise your integrity. If you do mess up though admit your mistakes and learn from them. 5. Believing in ourselves. You are made for more. You are here for a purpose. You have a gift to share with the world that no one else has. God has a plan for your life. 6. Connecting with others who are a positive influence. You are the average of the five people you hang out with the most. Think carefully about who you let into your inner circle and how they influence you. Surround yourself with people who believe in you, who challenge you and who cheer you on. A better life, a fulfilled life, the best for your life, that “more” you know in your soul you are meant for – it is right there within reach. It always has been. Stop eating crumbs and living small. Each day choose to dream bigger, work smarter and live better.